"Arts of the State, State of the Arts!" Kansas Originals is THE place to buy unique pieces of art, Kansas souvenirs, or anything in between! It is a shopper’s paradise for the whole family. Kansas Originals was designed to provide the world with this “Arts of the State” facility containing products Kansas citizens created using their passions and resources. Kansas Originals displays these Kansas products and promotes Kansas with its “Arts of the state” in two locations! The main store is located at I-70 Wilson exit 206, then 1/4 mile north on K-232. The Topeka location is Topeka Travel Center on the Turnpike 5 miles east of Topeka. Kansas icons such as wheat, sunflowers, windmills, etc. are sometimes painted, sewn, embroidered, or carved onto materials including wood, limestone, glass, fabric, eggs, and gourds. 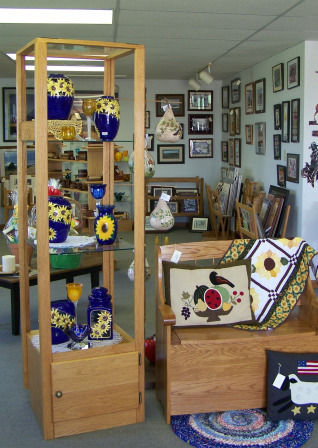 Popular store items include quilts, T-shirts, paintings, sun catchers, jewelry, books, wheat weaving, limestone benches, candles, artwork, blown glass orbs, Smelly Jellies, sculptures, toys, decorations, and well, you get the picture! Kansas Originals sells gourmet food products too! Friendly staff keep fresh coffee on in the food room, and have cookies and snacks for shoppers to sample. They have Kansas-made mixes for pancakes, cookies, soups, dips, etc., flavored popcorn, jams, jelly, honey, salsas, sodas, Kansas bottled water, and much more. Individuals, some who are retired or have other life challenges, small businesses, and others make up the nearly 300 members of the non-profit foundation that bring their fine arts, popular crafts and food products to Kansas Originals. Let's support them! Do you have young children or grandchildren? Stop at Kansas Originals and get an “I Spy” bag. They’ll love looking for little objects in the rice! “Turnabouts” intrigue most of us, especially teenagers! Stop and ask for these items, and look around. You’ll be amazed! Open 362 days a year! Monday-Saturday 9 a.m.-6 p.m.; Sunday 11 a.m.-6 p.m.